Food allergy represents an important issue in the field of food safety in industrialized countries because of the severity of allergenic reactions for affected persons even with small amounts of food. Recently, the food industries and legislative and regulatory agencies in different countries have formulated new regulations about displaying food allergen on food labels. Therefore, consumer protection and food labeling require reliable detection and quantification methods of allergens in food products. Several analytical approaches, with the ability of quantifying and detecting traces of allergenic ingredients, which target either the allergenic proteins or allergen markers (peptide fragment or gene segment) have been developed. The most popular methods for allergen detection can be mainly divided into two large groups: the protein-based approaches and the DNA-based approaches. Protein-based methods include enzyme-linked immunosorbent assays (ELISA), MS methods, and biosensors. On the basis of the amplification of specific DNA fragments, DNA-based methods can trace the potential presence of culprit allergen, which include polymerase chain reaction (PCR) and real-time PCR. 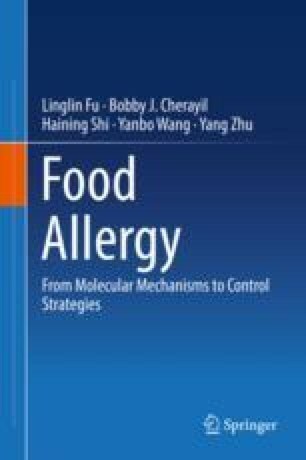 In this chapter, we present the advances about specific and highly sensitive analytical methods in the field of food allergens detection, which can avoid the influence by the presence of matrix components.